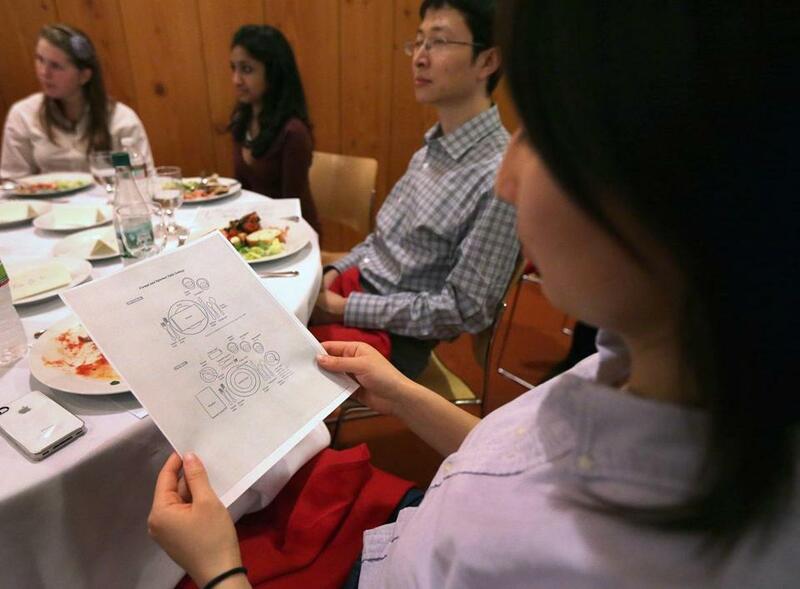 Student Lucy Zhao studied table settings at an MIT miniclass on enhancing social skills. CAMBRIDGE — Red napkin pyramids graced white plates in a dining area in MIT’s Stata Center, as students wandered in to find handwritten place cards bearing their names. Women wore simple dresses and flats, or skirts and blouses with pumps. Men wore crisp shirts and ties, though some sported sneakers and white socks with khakis. Amid world-renowned computer science and artificial intelligence labs, about 50 students dressed in their professional best for a different kind of lesson: etiquette for a business dinner. Last week’s session was part of the university’s ­annual Charm School, a tongue-in-cheek series of miniclasses celebrating its 20th anniversary. Although most MIT students can conquer a problem set with ease, some may not know the proper way to hold a wine class or how to politely request a letter of recommendation. In short, the classes, which take place over three days, help them develop an outer polish to match their intellectual brilliance, with a goal of providing skills to get and keep jobs. As times and technology have changed, the school has adapted. Tempted to text during dinner? It’s a no-no. “It’ll be interesting to learn some etiquette, especially now, when people don’t pay any atten­tion, especially on dates,” freshman ­Priyanka Shome, 18, of ­Lubbock, Texas, said as the dinner got underway. At table four, the students exchanged genial introductions and conversed easily about ­majors, student housing, and career plans. “My mom raised me really well, so I think I already know everything I need to know, but we’ll see,” said Maggie Kane, 19, a sophomore from San Jose, Calif. Some admitted that the ­etiquette lesson was not the ­only attraction. “It’s free food, so that’s good,” said freshman Alice Lu, 18, who was born in China but grew up in Cambridge. Lu also hoped for practical tips. Because her family ­uses chopsticks at home, she said, she picked up Western ­table skills mostly through friends. What did she hope to learn? “How to eat spaghetti politely,” Lu said. Do keep your napkin folded in half, and place it on your chair if you leave the table. Do hold a red wine glass by the bowl but a white wine glass by the stem. Do butter bread one bite at a time. Don’t twirl spaghetti on a spoon; cut it with a knife, or shake your fork to drop loose noodles. Don’t order alcohol, appetizers, or dessert if no one else does. Don’t put your cellphone on the table or use it during a meal. Timothy Murray, a mechanical engineering graduate student from Vancouver, said he rarely checks his phone during dinners with parents and never with grandparents. Even peers often turn off phones and place them in the table’s center ­until they have eaten, he said. “I think that people have ­noticed that it’s more than just manners; it’s annoying,” ­Murray, 23, said of texting at the table. The purpose of all etiquette, Bryan told the students, is to put others at ease, and sometimes that means adapting to a situation. “The first duty of any host is to make people feel really, really comfortable,” she said. In an interview, Bryan praised the students’ etiquette knowledge, but said their generation is at a disadvantage. Many young people today, she said, grow up with single parents, or parents who work long hours, and family dinners, where children traditionally learned table manners, are rare. Founded in 1993 by Travis Merritt, an MIT literature professor, the program awards graduates a ChD, doctor of charm. Alana Hamlett, assistant ­director for student activities and coordinator of the Charm School, said in its early days Merritt would hand out violations for breaches of decorum to encourage students to brush up on their manners. “The spirit of the program was always to help students be a little bit better than they ­already are and to take the lessons that they learn beyond the classroom,” said Hamlett, 28. The message may not reach every student. At the dinner, women outnumbered men 3 to 1, although 55 percent of under­graduates and 69 percent of graduate students are men. Some said those attending may not be those who need charm school most.